H.M.S. 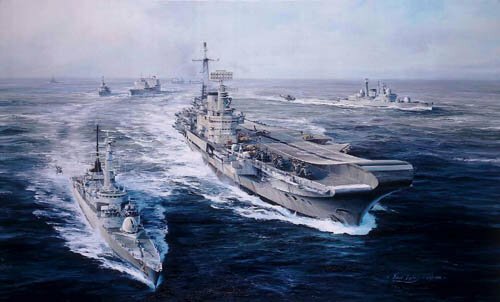 Hermes prepares to launch her Sea Harriers whilst a Sea King stands off: H.M.S. Arrow in the foreground ploughs into the swell, whilst H.M.S. Sheffield keeps station off the port beam. Following are H.M.S. Glamorgan and the auxiliary Fleet Tankers Olna and Resource. Overall print size:27" x 20"
Commander of Land Forces: .